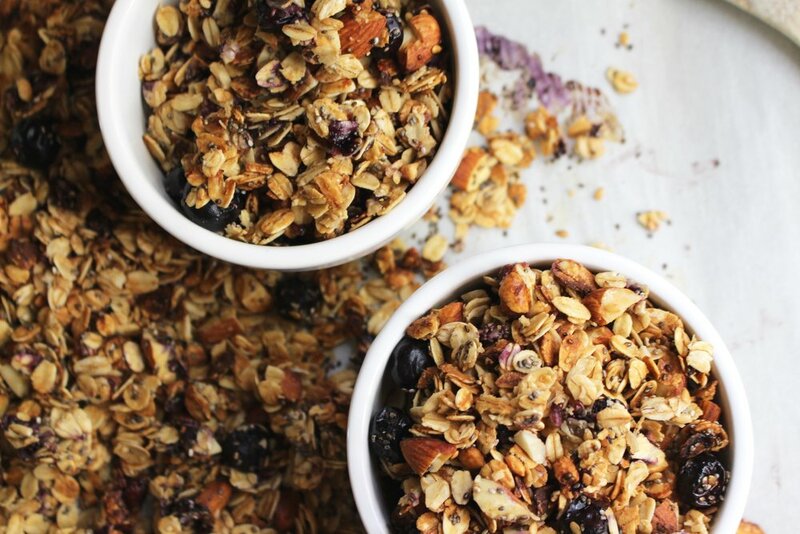 It's all about the subtle sweetness, crunchy chunks, and healthy benefits that makes me love granola as much as I do! Lately I've been obsessing over the entire Purely Elizabeth line, and cannot seem to keep her granola in my pantry for more than two days - it's that good. Her granola is actually the only store bought granola I've found to be worth buying, nutrition wise. Of course there are plenty of cheaper alternatives, but Purely Elizabeth uses some really great ingredients and natural sugars for sweetness. Inspired, and fresh out of granola (again), I decided to whip up my own super healthy recipe and add a delicious twist - blueberries! Blueberries are said to be one of the best foods for you. They have a ton of vitamins and minerals, as well as antioxidants and prebiotic fiber to keep you feeling your best! 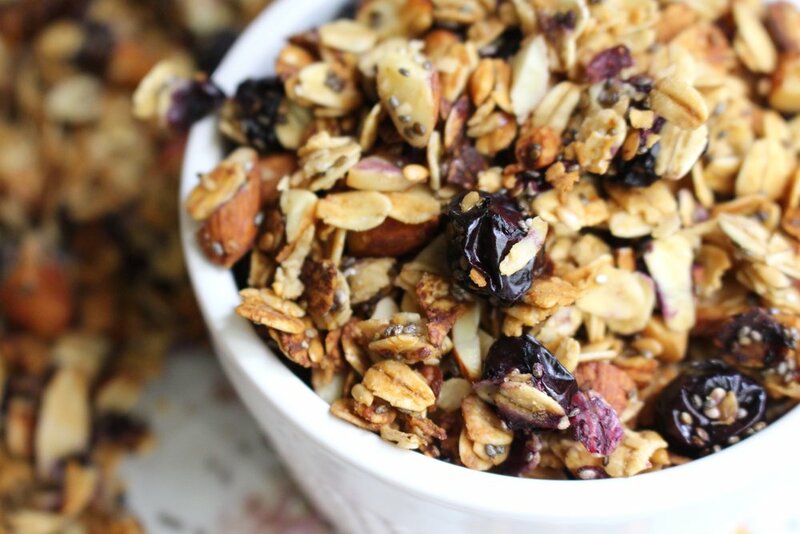 This granola is the perfect breakfast, topping, or snack for any day of the week. 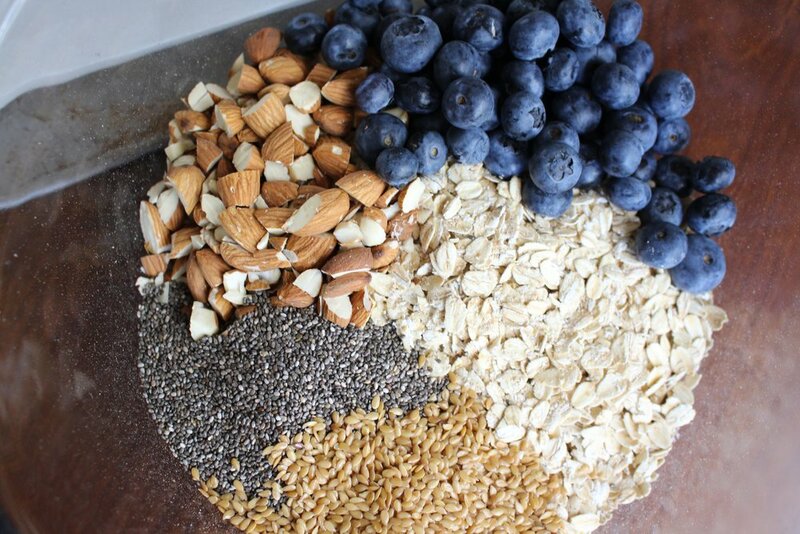 It is a great source of healthy carbohydrates and fats, natural proteins, and antioxidants. Not only is it going to keep you feeling fuller longer, but it's not going to leave you feeling tired and foggy like a sugary cereal or store bought granola would. The natural sweetness from the honey, nutty almonds, and tart blueberries work together perfectly and I hope you enjoy it as much as I did! 1/2 cup honey, 1 and 1/2 tbsp. unrefined coconut oil, and 1 tbsp. natural peanut butter *Any nut butter will work! Once your granola is well combined, evenly spread the granola on a parchment lined baking sheet and bake at 350°F for 10-15 minutes. You will notice the outside portions will brown before the middle, so be sure to give it a good mix about half way through!